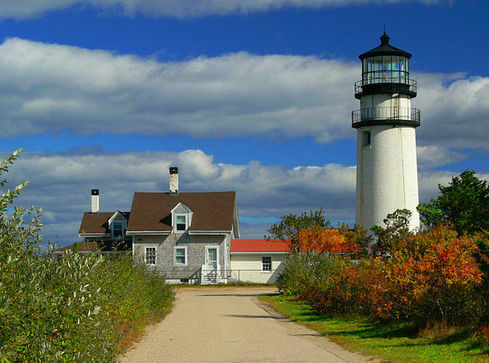 Highland Lighthouse was the first lighthouse built on Cape Cod - built on ten acres originally owned by Isaac Small in North Truro. The walkway up to the lighthouse from the parking area is along the original right of way that Small had conveyed in his deed. The lighthouse was first lighted in 1797 and served as a way to reduce the number of ships running aground along Cape Cod. The sea was an important route not only for travel to Boston and New York, but also as a way to make a living - fishing, whaling and trade. The tower was originally a 45 foot tall wooden one, but then replaced by a 30 foot brick tower in the 1830's. In the 1850's, as he worked on his book Cape Cod, Henry Thoreau had stayed here as a guest of the lightkeeper; Thoreau had marveled at the sights and harsh weather here. Due to deterioration of the lighthouse due to the weather, the tower was completely replaced with a new 66 foot brick tower in 1857; the total cost was just $17,000. How times change! This is the same tower still in use today, but it was moved about 450 feet inland in 1996 due to the severe coastal erosion. In the 1850's, the tower had an oil lamp with four lighted wicks and a twelve foot high Fresnel lens. This system was replaced by a rotating lens in 1901 and then fitted with an electric bulb in 1932. This resulted at the time in the tallest and most powerful lighthouse on the New England coast. 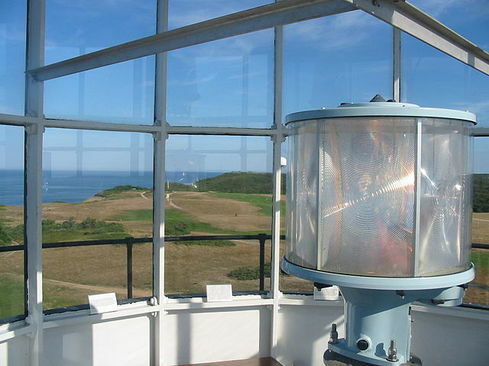 In the 1950's, two aerobeacons were installed; at that time, the Fresnel lens was removed and also damaged, but portions of it can still be seen in the museum in the lighthouse buildings. In 1986, the lighthouse was fully automated and still is operational today. Presently, a VRB-25 lighting system is used, installed in 1998. 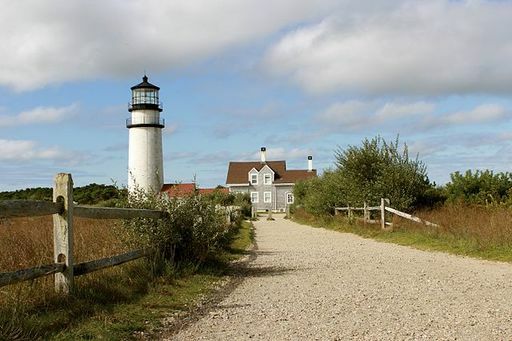 You can visit the grounds, now part of the Cape Cod National Seashore, all year round, with guided tours of the lighthouse itself and a museum and gift store open from May - October. Take Highland Road from Route 6 in North Truro to its end, then turn right on South Highland Road, and then left onto Highland Light Road, where there is parking on the right.